The Filipino version of the Beef Steak is Bistek Tagalog. This version is made of Tanigue instead of Beef and made creamier with the addition of All Purpose Cream. Bistek na Tanigue with Cream Recipe is comprised of sliced Tanigue fish cooked in soy sauce and calamansi juice and garnished with fresh onion rings. This simple yet great tasting Bistek na Tanigue with Cream Recipe does not require much ingredients and the procedure is not complicated at all. It is easy to cook, very delicious and a healthy recipe, try and tell us what you think. Drain the Tanigue and separate the marinade then in the same pan where the onions were fried, fry the marinated Tanigue until color turns brown. Set aside. Saute garlic for a few minutes, then drain the oil and pour the marinade and bring to a boil. Put in the Tanique, add the All purpose Cream and simmer for 10 to 15 minutes. Add soy sauce to taste and the stir-fried onions. Add the onion rings for garnish or scallions and Serve hot. 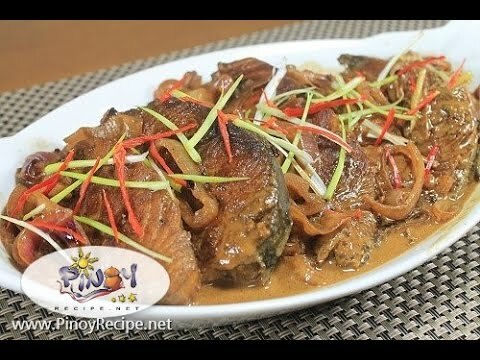 Bistek na Tanigue with Cream Recipe is a delicious Filipino dish that does not require much ingredients. This sounds delicious. I will have to try this soon.